A couple of weeks ago I published a piece on Book Riot called "Literary Moments of the Golden Girls: A Complete List." I don't want to overstate things here, but (like I said on Twitter), I think it might be the most important thing I have ever written or will ever write. Below are just the library references I pulled for the post, but I encourage you to read the whole thing. It was a lot of fun to put together...and the girls were surprisingly literary! 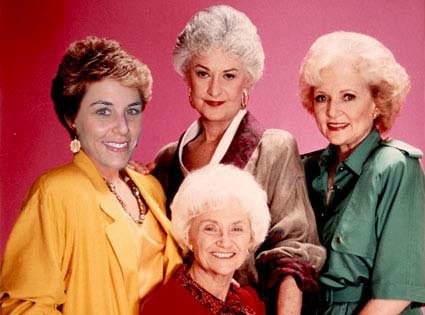 And if you doubt my undying love for The Golden Girls, here's a picture my friend Brian made for me five years ago in which I get to be Blanche. Truly, a dream come true. Picture it: Sophia is having chest pains and the girls talk as they wait for an ambulance. Picture it: Rose tells one of her infamous St. Olaf stories about Mr. Minky, her town’s surly librarian. Picture it: Dorothy and Blanche go to the library and Blanche meets a nice man (who later turns out to be not-so-nice).